The Alhambra is the red fortress which sits on the hill overlooking Granada and covers an area of approximately 140,000m². 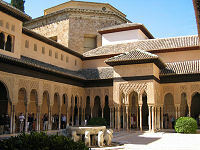 Once the residence of the Muslim rulers and their court, it is now one of Spain's major tourist attractions. There are three parts to the Alhambra: the ornate Nazrid Palaces (you will be given a time to enter these), the Alcazaba (the battlements) and the Generalife (the gardens). 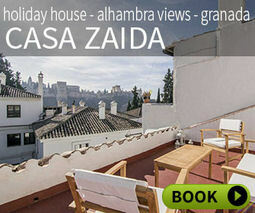 Alhambra tickets are valid for the full day if you choose the general visit option. 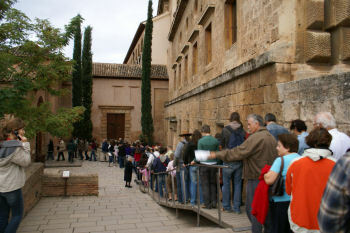 If you are only coming to Granada for a day or two it's worth getting your tickets in advance because there can be long queues and it may even be impossible. This webpage contains all the information that you will need. The usual route around the Alhambra is 3.5km long and it takes 3 hours to visit the 3 areas of the Alhambra complex. There is a large carpark and plenty of restaurants where you can get inexpensive meals and snacks. 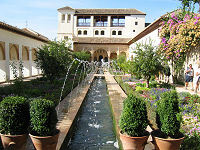 The cheapest Alhambra tickets can be bought directly from the Alhambra: from either the Alhambra ticket office, by phone or online. When you buy your tickets, you will be given a half-hour slot to enter the Nazrid Palaces. You must not be late as they are now very strict. There is always a queue but sometimes people queue for the next session. Alhambra attendants normally go along the queue to check that everyone with tickets for a particular time gets in so if you arrive with only a few minutes to spare, it is a good idea to show your ticket to an attendant to make sure you don't need to go to the front of the queue. See map for more information about the Alhambra (car parks, entrances, ticket office, etc. ).